What is considered earned income for EIC purposes? Where do I enter information if a taxpayer has more than three children who qualify for EIC? What are the income limits and other rules to generate EIC? What are the Form 8867 EIC tiebreaker rules referenced on Screen 2? A taxpayer is not getting the Earned Income Credit (EIC). I cannot see why. Is there anything in Drake Tax that will help me? How can I suppress the Earned Income Credit (EIC)? Will the software alert me when a taxpayer’s 1040 may qualify for EIC? 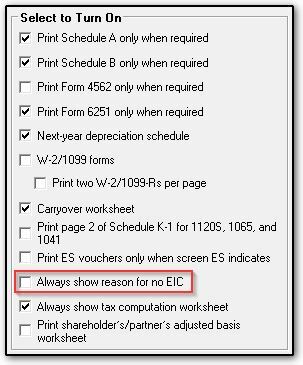 When is Form 8867 EIC Checklist NOT produced for returns involving EIC? Wages, salaries, tips, and other taxable employee pay. Employee pay is earned income only if it is taxable. Amounts received for performing ministerial duties as an employee. Disability benefits received under an employer’s disability retirement plan until you reach minimum retirement age. Note: Nontaxable combat pay can be included as part of the earned income. Social Security and railroad retirement benefits. Veterans’ benefits, including VA rehabilitation payments. See Pub. 596, Earned Income Credit (EIC), for information about the inclusion of income in a community property state for EIC purposes. EIC rules include four levels of income limits based on the number of qualifying children: no qualifying children, one qualifying child, two qualifying children, and 3 or more qualifying children. Since the fourth level only requires 3 or more qualifying children, there is no need to report more than three children for EIC purposes. The IRS provides places for only Child 1, Child 2, and Child 3 on Schedule EIC, consistent with IRS Publication 596, Earned Income Credit. Accordingly, screen DD1 (EIC1 in Drake15 and prior) provides entry fields for three children. For more information, refer to IRS Publication 596, Earned Income Credit (EIC). Publication 3524, EITC Eligibility Checklist, is also helpful. Note that the preparer must answer all questions on the EIC (8867) screen, and on screen 2 for dependents. Form 8867, Paid Preparer's Earned Income Credit Checklist, is submitted with the return. The taxpayer must have a valid social security number. The taxpayer's filing status cannot be MFS (Married Filing Separately). The taxpayer must be a U.S. Citizen or resident alien all year. The taxpayer's return cannot include Form 2555 or Form 2555EZ. The taxpayer must have earned income (MFJ, at least one taxpayer). The taxpayer can elect to include nontaxable combat pay (see Pub. 3, Armed Forces’ Tax Guide) in earned income for the earned income credit. permanently and totally disabled at any time during the filing year, regardless of age. brother, sister, half brother, half sister, stepbrother, stepsister, or a descendant of any of them (for example, a niece or nephew). A qualifying child cannot be used by more than one person to claim the EIC. The taxpayer cannot be a qualifying child of another taxpayer. Additional Rules for a taxpayer without a qualifying child. Must be at least age 25 but under age 65 at the end of the filing year (MFJ, at least one taxpayer). Cannot be the dependent of another person. Cannot be a qualifying child of another taxpayer. See Pub. 596, and Pub. 3524, for additional details. The exemption for the child. The tiebreaker rules ... explain who, if anyone, can claim the EIC when more than one person has the same qualifying child. However, the tiebreaker rules do not apply if the other person is your spouse and you file a joint return. Tiebreaker rules. To determine which person can treat the child as a qualifying child to claim the six tax benefits just listed, the following tiebreaker rules apply. If the parents do not file a joint return together but both parents claim the child as a qualifying child, the IRS will treat the child as the qualifying child of the parent with whom the child lived for the longer period of time during the year. If the child lived with each parent for the same amount of time, the IRS will treat the child as the qualifying child of the parent who had the higher adjusted gross income (AGI) for the year. If a parent can claim the child as a qualifying child but no parent does so claim the child, the child is treated as the qualifying child of the person who had the highest AGI for the year, but only if that person's AGI is higher than the highest AGI of any of the child's parents who can claim the child. If the child's parents file a joint return with each other, this rule can be applied by treating the parents' total AGI as divided evenly between them. Beginning in Drake15, a new PRNT screen option will produce a NOTES page note saying why EIC is not being produced. At the bottom left of the screen, select EIC not being calculated? Mark this box, then see NOTES in View mode for explanation. You can also turn this option on globally from the home page of Drake by going to Setup > Options > Form & Schedule Options and check the box Always show reason for no EIC. Click the OK button and view the return to see why EIC is not calculating. EIC IS NOT BEING CALCULATED FOR THIS RETURN: The taxpayer's investment income is over the limit to qualify for EIC. The IRS instructions state: "Investment income must be no more than $3,500 for the year." How can I suppress or otherwise block the EIC from producing? The Earned Income Credit (EIC) can be suppressed or blocked in data entry on screen 8867 EIC – Paid Preparer’s Checklist. In the section labeled EIC Calculation Overrides, type the word NO in the override field. Starting in Drake18, when the override is used, the literal "NO" appears to the left of line 17a for the Earned Income Credit (EIC) on the return. 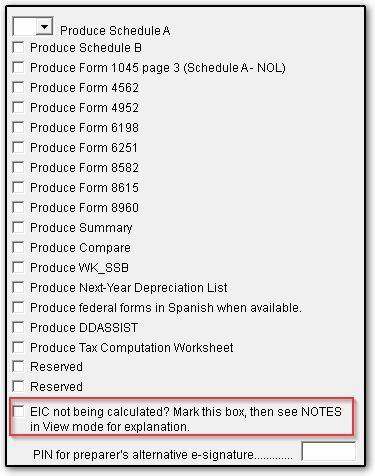 In Drake17 and prior, when this override field is used, the literal "NO" appears to the right of the "Earned income credit (EIC)" line on the return (line 66a of Form 1040, line 42a of Form 1040A, and line 8a of Form 1040-EZ). The software provides messages to alert you that the taxpayer may qualify for the Earned Income Credit (EIC). These messages are triggered when filing status, age, dependent information (if applicable), and income meet EIC guidelines, as established in Pub. 596, Earned Income Credit (EIC). Such messages prevent the return from being e-filed until the preparer completes the expected data entry. If there are dependents included on the return who may qualify the taxpayer for EIC, message 5587 may be produced. MISSING EIC INFORMATION: There are one or more children on the return who may qualify for EIC but the questions on screen 2 have not been answered. Be sure you have answered all questions related to EIC under EIC Information, including those related to Residency of Qualifying Child, before leaving screen 2, Dependent Information. If you have not completed all necessary entries to meet guidelines, you may also receive message 5588, discussed next. If you have not completed the information required for Form 8867, and information on the return indicates the taxpayer may qualify for EIC, message 5588 may be produced. DUE DILIGENCE CHECKLIST INCOMPLETE: The IRS requires certain questions on Form 8867 be answered by the preparer for due diligence purposes. Some of the questions have not been answered. IMPORTANT: Paid preparers of federal income tax returns or claims for refund involving the EIC must meet due diligence requirements in determining the taxpayer's eligibility for, and the amount of, the EIC. Failure to meet these due diligence requirements could result in a penalty of more than $500 for each failure. See Internal Revenue Code section 6695(g). Please review your entries on screen 8867 (EIC – Paid Preparer’s Checklist) and screen 2 (Dependent Information) under EIC Information, if applicable. For more information, see the IRS websites Earned Income Tax Credit (EITC) and EITC Central and also Pub. 3524, EITC Eligibility Checklist Poster. Note: Other messages, or error pages, may be triggered, based on data entry, related to EIC rules. If a paid preparer prepares a federal income tax return or a claim for refund that involves the Earned Income Credit (EIC), that preparer is required to complete Form 8867, Paid Preparer’s Earned Income Credit Checklist. In most cases, the Drake tax program automatically generates this form and requires that the preparer complete the 8867 screen for any return that involves EIC. Displays a number that has not been assigned to a preparer in Setup > Preparer(s). This can only occur if the number is “forced” into the field. Is blank and you are logged in as Admin. If the software cannot identify a preparer, it will not produce the 8867. You must log in as a preparer, or you must set the Preparer # field to a valid preparer.